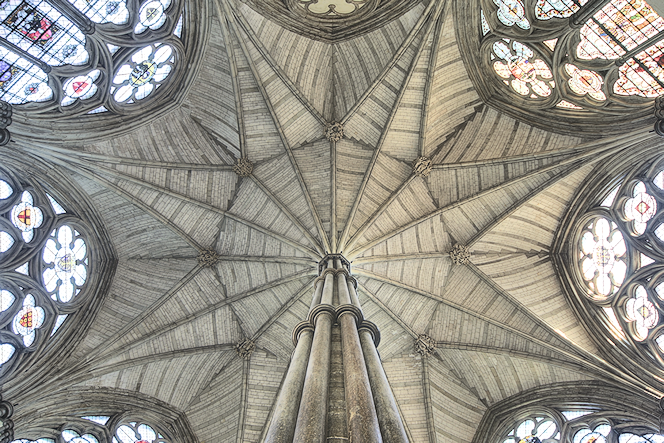 The Chapter House is an octagonal building at Westminster Abbey, noted for its magni­ficent windows, sculp­tures and vaulted ceiling (shown below). It served as a meeting place for the abbey’s monks and other dignit­aries, and also regularly for Parliament between 1377 and 1547. The present structure was completed in 1253; its prede­cessor, which was probably round, was built in the 1050s. An oak door in the vestibule of the Chapter House has been identified as the oldest in Britain. The door was reused from the original building and was said to have been covered in the skin of a sacri­le­gious felon who was flogged to death in the Middle Ages. However, fragments of hide found on the door have been tested and identified as having belonged to a cow. A portrait of the Queen by Ralph Heimans went back on display in the Chapter House in mid-July 2013 – with a enlarged security barrier and a guard in place – a month after the painting had been defaced with purple paint by a Fathers4Justice campaigner.